Name Variation Wynema Zajicek was also known as Sue. Married Name 5 June 1947 As of 5 June 1947,her married name was Schmitz. Wynema Zajicek was born on 14 September 1921 at Wisconsin. She was the daughter of Frank Zajicek and Josephine Farrington. Wynema Zajicek married Kenneth P. Schmitz, son of Hubert Peter Schmitz and Clara Gertrude Klein, on 5 June 1947. Wynema Zajicek died on 3 June 2014 at age 92 Wynema “Sue” Schmitz age 92 of Bear Valley passed away on Tuesday, June 3, 2014 at the Greenway Manor Nursing Home in Spring Green 2 hours after her sister, Eileen Angle passed away. She was born on September 14, 1921 in Petersburg, WI the daughter of Frank and Josephine (Farrington) Zajicek. She was married on June 5, 1947 to Kenneth Schmitz. Sue enjoyed playing cards, camping, cooking, baking, going out to eat, the outdoors, gardening and never complained. Her favorite saying was, “that’s the way the ball bounces”. She adored her grandchildren and great grandchildren. Survivors include, a son, Bert Schmitz of Lone Rock, 3 grandchildren, Vicki (Bruce) Hying of Dodgeville, Jean Schmitz and special friend, Kial Silvers of Richland Center, Kevin (Bethany) Schmitz of Bear Valley, 3 great grandchildren, a brother, Paul, nieces, nephews, other relatives and friends. She was preceded in death by her parents, Frank and Josephine Zajicek, her husband, Kenneth, a son, Joseph, a daughter-in-law, Mary Schmitz, 2 brothers, Galen and Jim Zajicek, 2 sisters, Renora Bremmer and Eileen Angle. A Mass of Christian Burial will be held jointly with her sister, Eileen Angle on Tuesday, June 10, 2014 at 11:00 A.M. at St. Luke’s Catholic Church in Plain. Fr. Mike Resop will officiate with burial in the St. Kilian's Catholic Cemetery in Bear Valley at 2:00 P.M. Visitation for Sue will be held on Monday, June 9, 2014 at the Richardson-Stafford Funeral Home in Spring Green from 4:00 P.M.-8:00 P.M. and at the church on Tuesday from 9:30 A.M. until the time of Mass. In lieu of flowers memorials may be made to St. Luke’s Catholic Church, St. Kilian’s Catholic Church or Sacred Heart Catholic Church. Online condolences available at www.staffordfuneralhomes.com. The Richardson-Stafford Funeral Home is assisting the family with the arrangements. Name Variation Joseph E. Schmitz was also known as Joe. Joseph E. Schmitz was born on 31 January 1949. He was the son of Kenneth P. Schmitz and Wynema Zajicek. Joseph E. Schmitz died on 28 July 2012 at age 63. (?) Schmitz died on 30 April 1925. She was born on 30 April 1925. She was the daughter of Hubert Peter Schmitz and Clara Gertrude Klein. Clarice Elizabeth Schmitz was born on 3 January 1929. Clarice Elizabeth Schmitz died on 24 March 1929. Domonic Bachim married Lenitta Miller. Married Name Her married name was Bachim. Lenitta Miller married Domonic Bachim. Irene Greenheck died on 15 April 1938. She was born on 15 April 1938. She was the daughter of Cornelius F. Greenheck and Mary E. Thibault. Peter Kaul Sr. was born on 21 November 1871 at Germany. He was the son of Cassimer Kaul and Anna Mary Moll. Peter Kaul Sr. married Theresia Pulvermacher, daughter of Michael Pulvermacher and Agnes Neuheisel, on 8 February 1899. Peter Kaul Sr. died on 14 June 1939 at age 67. [S245] U.S. Federal Census 1900 U.S. Federal Census, by Ancestry.com, ED129. Dwelling 145. Cassimer Kaul married Anna Mary Moll. Cassimer Kaul died before 1930. Married Name Her married name was Kaul. Anna Mary Moll married Cassimer Kaul. Anna Mary Moll was born circa 1846 at Germany. Peter Anthony Kaul was born on 23 February 1912 at Wisconsin. He was the son of Peter Kaul Sr. and Theresia Pulvermacher. Peter Anthony Kaul married Lenice V. Rockwell, daughter of Albert Simeon Rockwell and Nina Mabel Williams, on 1 September 1937. Peter Anthony Kaul died on 9 November 1973 at age 61. Married Name 1 September 1937 As of 1 September 1937,her married name was Kaul. Lenice V. Rockwell was born on 11 August 1911. She was the daughter of Albert Simeon Rockwell and Nina Mabel Williams. Lenice V. Rockwell married Peter Anthony Kaul, son of Peter Kaul Sr. and Theresia Pulvermacher, on 1 September 1937. Lenice V. Rockwell died on 30 September 1986 at age 75. Albert Simeon Rockwell married Nina Mabel Williams. Married Name Her married name was Rockwell. Nina Mabel Williams married Albert Simeon Rockwell. Name Variation Rose Mary Pulvermacher was also known as Rosie. Married Name 4 June 1960 As of 4 June 1960,her married name was Durst. Rose Mary Pulvermacher was born on 15 September 1942. She was the daughter of Michael Simon Pulvermacher and Mary Theresa Meister. Rose Mary Pulvermacher married James Edward Durst, son of Herman Joseph Durst and Theresa Marie Buss, on 4 June 1960. Rose Mary Pulvermacher died on 14 October 2002 at age 60 Rose Mary (Pulvermacher) Durst obituary. James Edward Durst was born on 28 July 1940. He was the son of Herman Joseph Durst and Theresa Marie Buss. 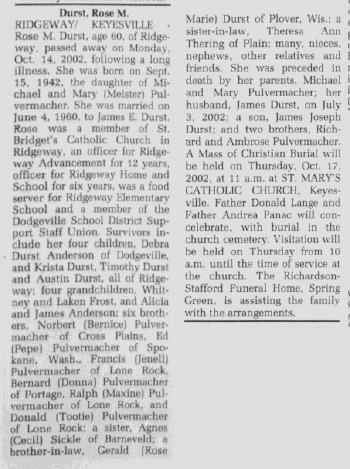 James Edward Durst married Rose Mary Pulvermacher, daughter of Michael Simon Pulvermacher and Mary Theresa Meister, on 4 June 1960. James Edward Durst died on 3 July 2002 at age 61. James Joseph Durst was born on 2 July 1962. He was the son of James Edward Durst and Rose Mary Pulvermacher. James Joseph Durst died on 25 July 1962. Name Variation Rose Augusta Pulvermacher was also known as Rosie. Married Name 21 April 1936 As of 21 April 1936,her married name was Ganser. Rose Augusta Pulvermacher was born on 31 January 1914. She was the daughter of Peter Joseph Pulvermacher and Mary Catherine Wachter. Rose Augusta Pulvermacher married Alvin John Ganser on 21 April 1936. Rose Augusta Pulvermacher died on 19 March 2001 at age 87. [S243] U.S. Federal Census 1920 U.S. Federal Census, by Ancestry.com, ED201. Dwelling 143. Alvin John Ganser was born on 30 July 1912. He married Rose Augusta Pulvermacher, daughter of Peter Joseph Pulvermacher and Mary Catherine Wachter, on 21 April 1936. Alvin John Ganser died on 27 August 2001 at age 89. Ronald Alvin Ganser was born on 11 September 1955. He was the son of Alvin John Ganser and Rose Augusta Pulvermacher. Ronald Alvin Ganser died on 31 July 1975 at age 19. Francis E. Huebsch was born on 5 May 1911 at Wisconsin. He was the son of Frank John Huebsch and Myrtle Davison. Francis E. Huebsch married Amelia Barbara Pulvermacher, daughter of Mathew Pulvermacher and Anna Bindl, on 28 October 1931. Francis E. Huebsch died on 10 March 1987 at age 75. Name Variation Frank John Huebsch was also known as Frank F.
Frank John Huebsch was born on 3 April 1886 at Wisconsin. He was the son of Adam John Huebsch and Agnes Clara Misslich. Frank John Huebsch married Myrtle Davison on 23 September 1908. Frank John Huebsch married Marie A. Pulvermacher, daughter of Mathew Pulvermacher and Anna Bindl, on 20 October 1937. Frank John Huebsch died on 28 February 1974 at age 87. Frank John Huebsch obtained US Social Security Card at Wisconsin; last residence Sextonville, Richland, Wisconsin. On 12 September 1918 at World War I Draft Registration, Richland, Wisconsin. Married Name 23 September 1908 As of 23 September 1908,her married name was Huebsch. Myrtle Davison married Frank John Huebsch, son of Adam John Huebsch and Agnes Clara Misslich, on 23 September 1908. Married Name 4 July 1931 As of 4 July 1931,her married name was Kearney. Mary Elizabeth Pulvermacher was born on 6 May 1909. Mary Elizabeth Pulvermacher married Edward James Kearney, son of Francis J. Kearney and Ada Mae Perkins, on 4 July 1931. Mary Elizabeth Pulvermacher died on 4 June 1991 at age 82. [S244] U.S. Federal Census 1910 U.S. Federal Census, by Ancestry.com, ED4. Dwelling 60. Edward James Kearney was born on 30 January 1912. He was the son of Francis J. Kearney and Ada Mae Perkins. Edward James Kearney married Mary Elizabeth Pulvermacher, daughter of Peter Joseph Pulvermacher and Mary Catherine Wachter, on 4 July 1931. Edward James Kearney died on 21 January 1950 at age 37. Name Variation Francis J. Kearney was also known as Frank J.
Francis J. Kearney was born on 17 November 1870 at Wisconsin. He was the son of John Kearney and Dianna Ghering. Francis J. Kearney married Ada Mae Perkins, daughter of Philander Perry Perkins and Amarilla McFarland, on 25 August 1901. Francis J. Kearney died on 16 December 1951 at age 81. [S244] U.S. Federal Census 1910 U.S. Federal Census, by Ancestry.com, ED98. Dwelling 46. Married Name 25 August 1901 As of 25 August 1901,her married name was Kearney. Ada Mae Perkins was born on 19 December 1880 at Wisconsin. She was the daughter of Philander Perry Perkins and Amarilla McFarland. Ada Mae Perkins married Francis J. Kearney, son of John Kearney and Dianna Ghering, on 25 August 1901. Ada Mae Perkins died on 18 August 1976 at age 95. Ada Mae Perkins had 3 with 3 living in 1910 children. Frederick Peter Pulvermacher was born on 24 October 1895. He was the son of Peter Joseph Pulvermacher and Mary Catherine Wachter. Frederick Peter Pulvermacher married Josephine Helen Miller on 23 June 1920. Frederick Peter Pulvermacher died on 2 June 1979 at age 83. Married Name 23 June 1920 As of 23 June 1920,her married name was Pulvermacher. Josephine Helen Miller was born on 28 November 1896. She married Frederick Peter Pulvermacher, son of Peter Joseph Pulvermacher and Mary Catherine Wachter, on 23 June 1920. Josephine Helen Miller died on 3 October 1960 at age 63. Peter E. Wachter married Magdalena Schafer. Peter E. Wachter was born on 21 April 1832 at Bavaria, Germany, also reported as 21 April 1822. He married Barbara Joseph on 4 October 1892 at second marriage for her, Sauk, Wisconsin. Peter E. Wachter died on 23 May 1902 at Dane, Wisconsin, at age 70. Peter E. Wachter was a shoemaker in 1870. [S248] U.S. Federal Census 1860 U.S. Federal Census, by Ancestry.com, Page 17. Dwelling 114. [S247] U.S. Federal Census 1870 U.S. Federal Census, by Ancestry.com, Page 18. Dwelling 125. [S246] U.S. Federal Census 1880 U.S. Federal Census, by Ancestry.com, Page 21. Dwelling 154. [S245] U.S. Federal Census 1900 U.S. Federal Census, by Ancestry.com, ED64. Dwelling 174.